According to the International Labour Organization (ILO), over 2.78 million people still die each year from a work-related illness or injury, aside from the thousands of life-changing industrial diseases and injuries suffered by workers on a daily basis. While this obviously has an enormous impact on families and communities, the cost of having accidents to business and economies is likely significant. 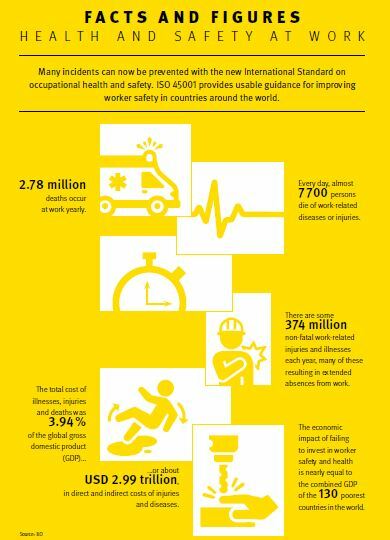 These figures were definitely what triggered the development of the newest International Standard, ISO 45001, which will replace OHSAS 18001 and will become the baseline for Occupational Health and Safety Management. The standard provides framework and guidelines for organizations to better control potential risks, and prevent work-related injuries, ill health and death. It also sets forth the specifications for systematic analysis, manages risk and regulatory compliance and evaluates occupational health and safety performance. In 2013 the project committee ISO/PC 283 was established to produce an international standard addressing occupational health and safety management systems (OHSMS’s). The standard they have developed, ISO 45001:2018, was published on 12 March 2018, which enable organizations to improve their occupational health and safety performance, prevent work-related injury and ill health, and provide safe and healthy workplaces. Taking a risk-based approach dependent on each user’s individual situation, ISO 45001 is designed to make organizations think broadly about anything that can have a detrimental effect on workers and people nearby. It considers our changing work environment: including travel from and to the workplace, to whom the workers are in an organization whether outsources, contractors, permanent, or volunteers. ISO 45001 also recognizes the complexity of occupational health and safety in the 21st century, where emerging technologies and industries are revealing new challenges. While ISO 45001 draws on the existing occupational health and safety management system standard OHSAS 18001, it is a new and distinct standard rather than a revision or update. Those leading, managing and auditing OH&S management systems will need to revise their current thinking and work practices in order to maintain organizational compliance, and most importantly, to reap the benefits of an effective OH&S management system. As there is no previous version of the ISO standard to migrate from, organizations will have three years to migrate from OHSAS 18001 to ISO 45001. ISO 45001 shares a high-level structure (HLS), identical core text and terms and definitions with other recently revised ISO management system standards such as ISO 9001:2015 and ISO 14001:2015. This framework is designed to facilitate the integration of new management topics into an organization’s established management systems. In addition, ISO 45001 was designed to follow ISO 14001 fairly closely, as it is recognized that many organizations combine their OH&S and environmental management functions internally. 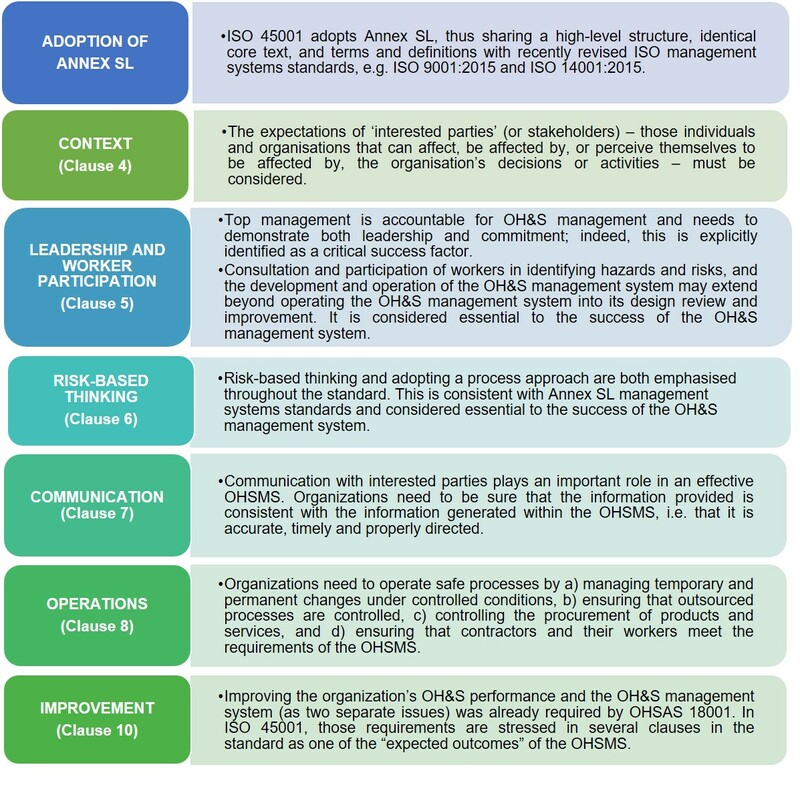 This will simplify the integration of ISO 45001, particularly for those who are familiar with ISO 14001.